The Army Corps is skipping the 14-day notification period and intend to grant the easement needed to drill no earlier than 24 hours after delivery of their Notice of Intent. Further threats to the water are clearly imminent. When the easement is granted, we’re asking for mass-distributed actions in support of water protectors and the SRST tribe who will file for temporary restraining order and an injunction to halt construction, but as we’ve seen before those filings will not stop the machines from digging into Unci Maka, Mother Earth. Construction could begin at any time. If you go to Standing Rock, expect police violence, mass arrests, felony charges for just about anything, abuse while in custody, targeted persecution and racial profiling while driving around the area, etc. We are calling for emergency actions all over the world. PLEASE, THIS IS OUR LAST STAND. Please visit everydayofaction.org to find or register an action wherever you are. 17 Banks are providing the money to build the Dakota Access Pipeline. We — as customers and account holders — can pressure the lending banks to take a stand. The Black Snake is not yet dead. Far from it. On January 24th, President Trump signed an executive order fast tracking the Dakota Access Pipeline and environmental reviews of other projects. Hundreds of thousands of us have signed petitions to the banks on the project loan for the Dakota Access Pipeline. Thousands more have closed their accounts and defunded over $50 million and counting. Now, it’s time to make our voices heard, in person. Download a cover letter summarizing the demands of over 500,000 people worldwide representing over $2.3 billion in assets already/ready to be divested. Print this letter and bring it with you to your bank action to deliver to a manager. Sign up to host or attend a #DefundDAPL in your town. Each event host will receive detailed instructions and a packet of materials to deliver to any branch of these 17 banks: Bank of Tokyo Mitsubishi UFJ, BayernLB, BBVA, BNP Paribas, Citigroup, Crédit Agricole, DNB ASA, ICBC, ING, Intesa Sanpaolo, Mizuho Bank, Natixis, SMBC, Société Générale, SunTrust Robinson Humphrey, TD Bank, Wells Fargo. All you have to do is enter your zip code, pick a local bank branch and show up. 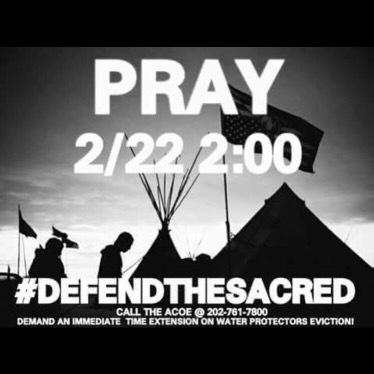 The Sacred Stone Camp will stand their ground as long as DAPL construction equipment remains on Oceti Sakowin treaty land. We can all continue to support them by submitting comments on the scope of the Environmental Impact Statement to U.S. Army Corps of Engineers. And feel free to email us at actions@nodaplsolidarity.org if you have any questions!